When you are installing carpeting in a business you need durability. Commercial carpet is designed specifically for the traffic that businesses get. Commercial carpet comes in a variety of choices in style, fiber, and color. Carpeting can add personality to the work environment from formal to laid back. In hotels it can provide directional cues. In healthcare carpet can be calming. It can provide sound dampening in a cubicle setting or a computer lab. Commercial carpet should be easy to maintain. Most are made flat and dense so they vacuum easily and be easy to clean. You have lots of options to choose from so you will want to consult with a professional once you have made the initial considerations. Define the specific requirements of the facility. Type of facility and the area receiving carpet. How long you would like the carpet to last. Whether access to subfloor is needed. Whether there is modular furniture in the space. On an average day, will there be spills or dirt tracked into the building? What about moisture? If so how much as this will definitely affect a lot of things? Is there exposure to chemicals or sun? What type of traffic and how much? Wheelchairs? Supply carts? These are the main concerns. You will also have other concerns about the installation and how it may disrupt your work environment. Professional carpet stores and installers will work with you to minimize any disruptions. 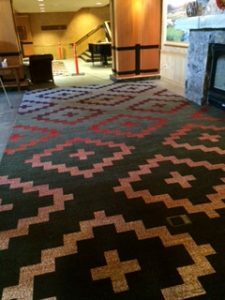 At Coventry Carpets, we have installed 1000’s yards of commercial carpet throughout Colorado. We are experts at helping you choose the best commercial carpet for your facility and location. We will come out and inspect where you will be installing the carpeting with our mobile showroom so you can see many options and we can give you a solid estimate on the cost. Listed below are just a few of some high profile commercial places we have installed Carpet. The Brown Palace Hotel (Denver), St. Julian Hotel (Boulder), Sonnenalp Hotel (Vail),Steamboat Grand Hotel (Steamboat Springs), The Glass House (Denver) Paramount Café ( Denver), Southridge Rec Center ( Highlands Ranch), Union Station (Denver) just to name a few of the places. Please call us to help with your next commercial project as you will receive our lifetime installation warranty and receive the best price in Colorado!